When you decide to invest in a quality knife, you make a decision to spend quality time in your kitchen, each and every time you cook. A decision that will enable you to focus on the details that make a meal excellent - instead of struggling to put something together. EXTREMELY DURABLE: Made from high quality japanese steel with a top of the line fiberglass handle, your LIPAVI knife will stay sharp for a very long time between sharpening - and it can withstand EXTREME conditions! WELL DESIGNED: Stylish, simple, elegant and ergonomic. A santoku knife like this is bound to be a conversational piece. 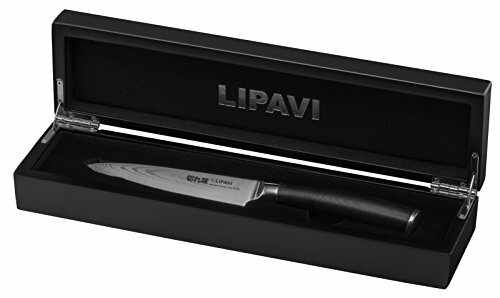 ELEGANTLY PACKAGED: All LIPAVI knives come in a luxurious, hinged wooden box. Perfect for storage, and even more perfect as a gift! If you have any questions about this product by LIPAVI, contact us by completing and submitting the form below. If you are looking for a specif part number, please include it with your message.